. إن شقق بالازو كولوناديز حريص على توفير الراحة للنزلاء، فلا يوفر الموظفون جهداً في تقديم أفضل الخدمات وضمان حسن الاستقبال. هذه بعض الخدمات الموجودة في هذا الفندق: تسجيل وصول/مغادرة سريع, تخزين الأمتعة, موقف سيارات, خدمة غرف, غرفة عائلية. في الفندق غرف نوم يتجاوز عددها 65، كلها مجهزة بعناية وجمال وبعضها مزود بـ تلفزيون بشاشة مسطحة, اتصال لاسلكي بالإنترنت, سياسة التدخين - غرف لغير المدخنين متاحة, مكيف هواء, تدفئة. يمكنك طلب اللائحة الكاملة للخدمات في الفندق ومن بينها جاكوزي, مركز للياقة البدنية, ساونا, مسار جولف - ضمن 3 كم, مسبح خارجي. يشكل شقق بالازو كولوناديز بخدماته الراقية وموقعه الممتاز، قاعدة مثالية للاستمتاع بإقامتك في المدينة. we have to clean and tidy up the place ourselves as per instruction on the letter before we left to prevent any further charge, and didn't provide any room service on our 3 days stay. other than that, excellent in terms of value for money with promotion. safety is offered in this apartment. those occupier who return after 10pm are given keys to garage and main lobby. kitchenette are in tip top good condition! love cooking in d apartment. washing of clothes are a breeze with dryer provided! distance to surfers paradise are just like 5mins drive. nearby! rooms provide heater during winter! so useful else we be shivering cold. good place to share for 4pax! Our 7 days of trip to gold coast was splendid. 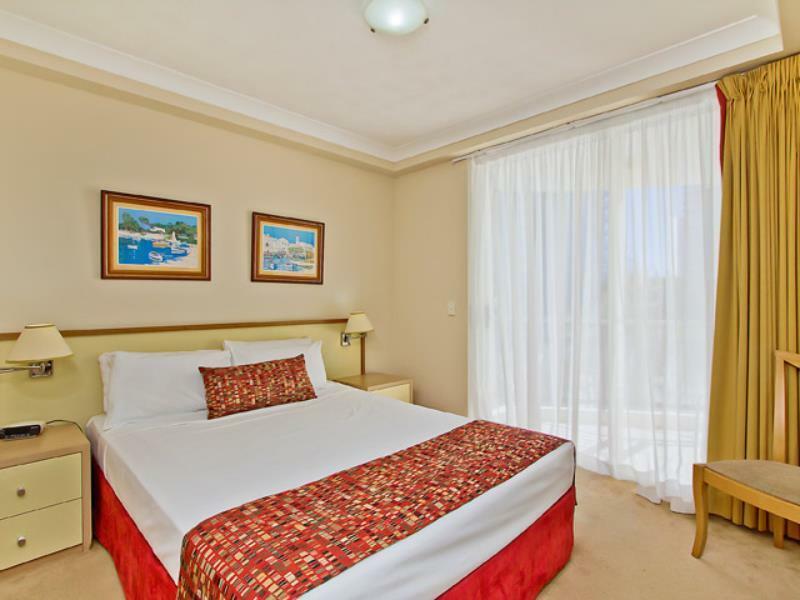 We are satisfied with the rooms and we even couldnt stop complimenting about the hotel room. It is all fully equiped. Kitchen utensils, microwave, oven, refrigerator, washing machine n dryer. The rooms is well maintained. But we were not satisfied with the internet wi-fi service. Super slow! We could only surf one website for the entire night. It is definitely not worth paying for. Nearby shops n restaurants are just walking distant. From airport to the hotel is quite far, n the taxi fee is so expensive. we're from malaysia, we chose this hotel from agoda from the rating and from the many good comments asians and non asian gave to this place. we arrived the apartment at night and the reception is closed but to no problem as we have informed them earlier that we will be arriving late and the check in is so simple just by calling the night shift personnel, advise on the number to the safe box at the entrance, pick up the key and get into the room ! this place is better than what it looks like in photos with good gym, nice swimming pool, online facility with a fee, heated jaccuzi, under ground parking with an auto door that keep our rented car safe. 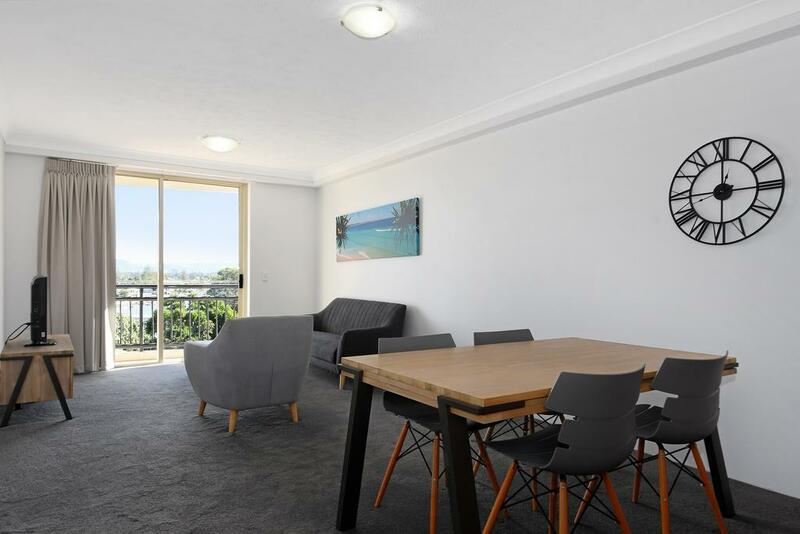 the view from the apartment is splendid, we did not ask for high floor but are automatically given one, from the balcony we can view the nice seaview with super waves in the morning and at night, we can view the nice surfers paradise night view with the amazing gigantic ferries wheels. conveniently right infront of this apartment is a bus stop with all bus to the theme parks, carrara market, major route buses pass by here and the bus station is just 3 blocks walking distant away. as for inside the apartment, this place is equipped with everything a family needed, cozy beds, nice furnitures, microwave, fridge, utensils, clean bathroom with heater and most of all the tv comes with cable tv programs ! trust me, you will need it when all shops closed at 5pm and nothing much u can do except night life, nice tv programs will come needy! the reception is super friendly and are more than willing to help and guide you to place of destination without even being asked ! overall, this place is recommended for family traveling with kids and old folks with a middle range budget but will be surprised with a cozy place to stay! We stayed in during spring for 4 nights and was glad we chose this hotel. Walking distance to the beach and varieties of shops. The 2 bedroom apartment is big enough for the 5 of us (3 adults and 2 kids) and we cooked almost every nights. Value for money for the rate we got at Agoda. We stayed for 3 nights in August 2018. The location was awesome! Views were great with canal and ocean views from our apartment. Staff were friendly and efficient. Room was clean and had everything we needed. I would totally recommend Palazzo Colonnades. Great location but really noisy as you can hear next door TV and also traffic from the road. You have to pay for internet. Overall it was good Apartment to stay. 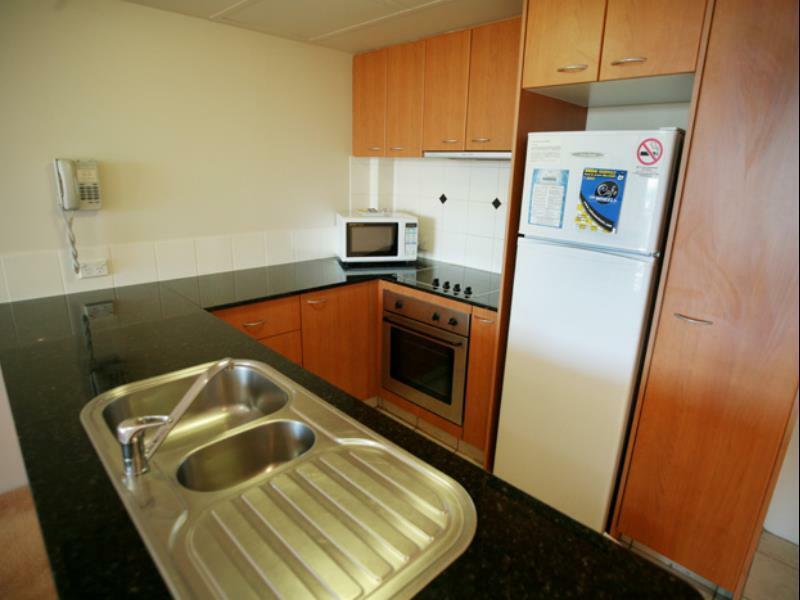 The apartment has a beautiful view and its fully equipped so you can choose to cook at home yourself. The view of the ocean is beautiful. We booked a 1 bedroom apartment and had a very satisfactory experience.We have tried quite a few places over the years visiting family and this was by far the best value in our visits.Most liked was it is very quiet,secure and clean.Location also can't be faulted. It was a beautiful holiday for us as we were a family of 10 where we booked 2 apartments, both were excellent. The location was amazing, the views were beautiful, very clean apartment with 2 bedrooms, the facilities were great, the staff were very friendly and their hotel prices are unbeatable! If we were to take a holiday, we will definitely choose this hotel and would recommend it to everyone, especially with young children. In general, the hotel is very tidy and is the kitchen is fully equip. We can't find the hotel. So do look out for the yellow dot logo which can be spotted easily. There is little note reminding us to keep room tidy, discard the rubbish ourselves and we have to set up and re-instate the sofa bed although we book & pay for 3 pax. Other than that, everything is OK.
arrived at a pleasant building low rise by surfers standards . the office staff are extremely helful and willing to book any activities , give bus directions etc. the accommodation was clean,with good sized separate living and bedroom . the kitchen was modern . there were 2 balconies . 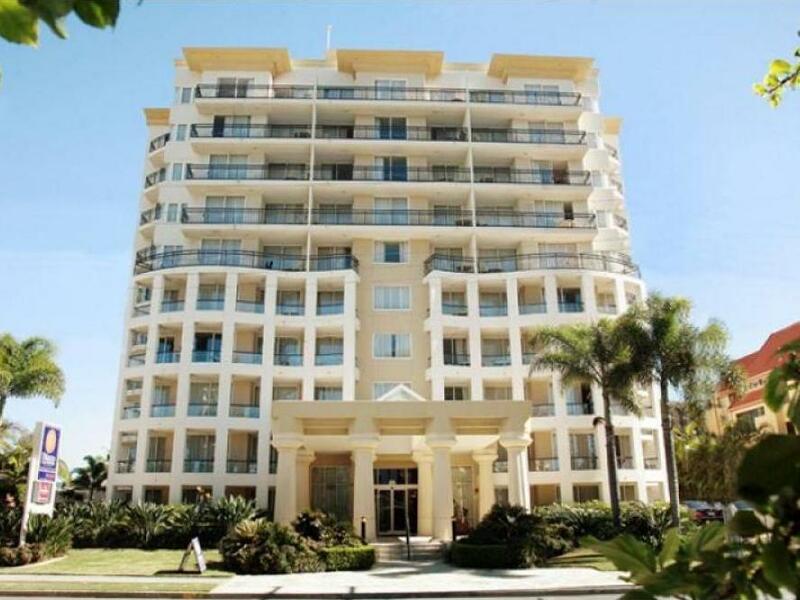 the location was excellent being 100metres from northcliffe beach and surf club. 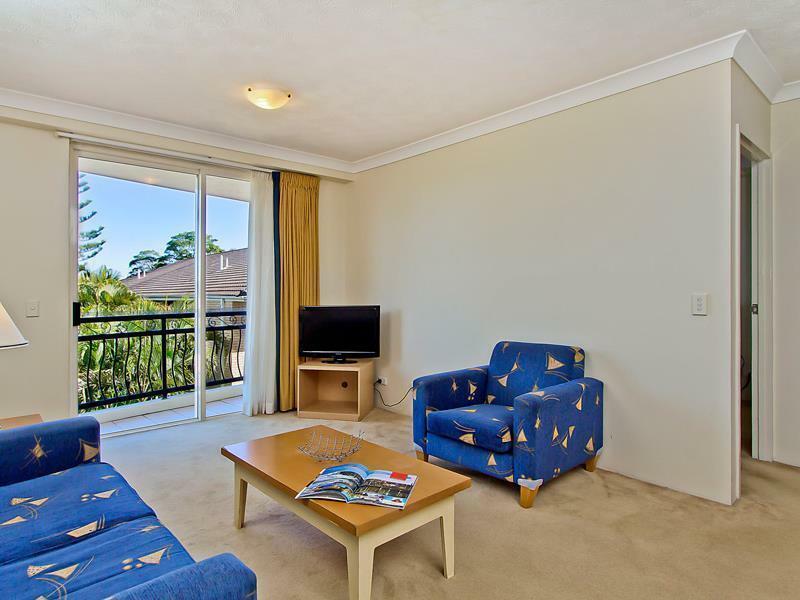 it was an easy walk into surfers via the street or beach.the accommodation was top value for the price. my partner and i stayed at this apartment resort for a total of three nights. it was such a comfortable stay i did not want to leave. we actually purchased the executive room which was nice as i had looked around at the prices of other places and thpught that this was the best value for money. it was so close to bus stops and shopping area in surfers that it felt extremly relaxing. 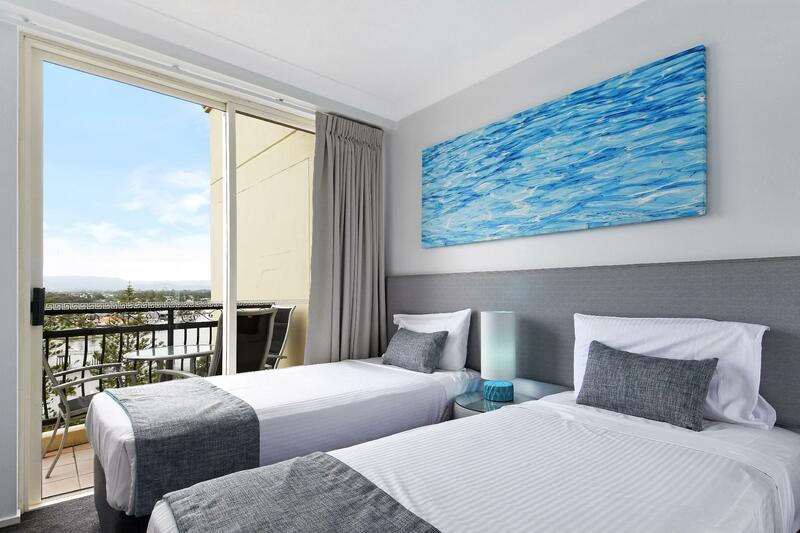 for a two person stay in surfers paradise i would definitley recomend staying here.